Our Waimea event was held at the Kuhio Hale Farmers Market. We had excellent weather and a great turnout. I estimate between 100 and 150 were at the event. We had 23 electric cars from across several makes – Tesla Model S and Model X, BMW i3, Chevy Bolt and Volt, Nissan LEAF, VW eGolf, BYD e6, Sondors electric bike, and and ELF solar bike. Representatives from Blue Planet Foundation and Ulupono Initiative (Honolulu-based non-profits dedicated to sustainability), a couple of PV companies, and our utility joined our event. Our BMW and Chevy dealers offered test drives of the BMW i3 and Chevy Bolt. Of course, our members offered rides and drives with their Tesla, Bolt, and LEAF vehicles. We had a good flow of participants throughout the event. The farmers market manager did several Facebook live events on the market’s page and this resulted in more residents coming to the event. It was very rewarding to hear about visitors making purchase decisions after joining our event. More photos from this event. 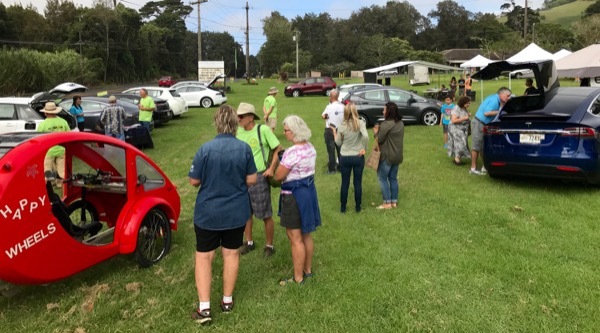 The Big Island Electric Vehicle Association will be hosting a National Drive Electric Week event at the Kuhio Hale Farmers Market*. This is a great opportunity to meet other EV owners, to learn about electric car benefits and ownership experiences, and see the latest EVs – Nissan LEAF, Chevy Volt, Chevy Bolt, Tesla Model S and X, BMW i3, VW Golf EV, and others. We'll offer test drives and rides and distribute information that can help with the EV purchase decisions. We hope to see you there. Bring your family and friends! *NOTE: We previously indicated Waimea Town Market at Parker School but had to change due to a last minute decision by the school administrators to decline the event. There are currently 48 attendees registered. Registered attendees report 241,554 electric miles driven.